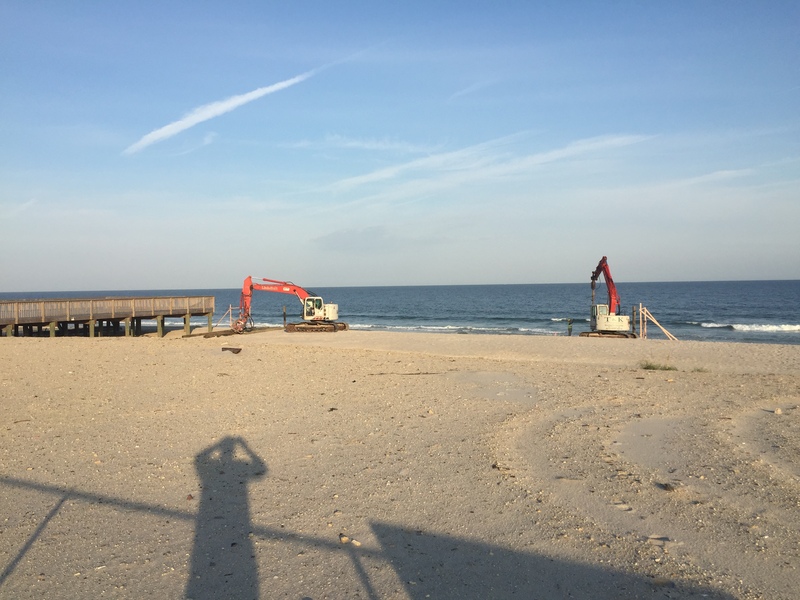 Construction crews installing new pilings and building the beginnings of what will be the restoration of numerous boardwalk properties in Seaside Heights – heavily damaged in Sandy, then fully destroyed in the 2013 boardwalk fire – began this week. The construction effort at the beachfront near Dupont Avenue – across the boardwalk from the Beachcomber Bar and Grill – drew a crowd of onlookers Wednesday, many snapping photos while enjoying unseasonably warm weather. 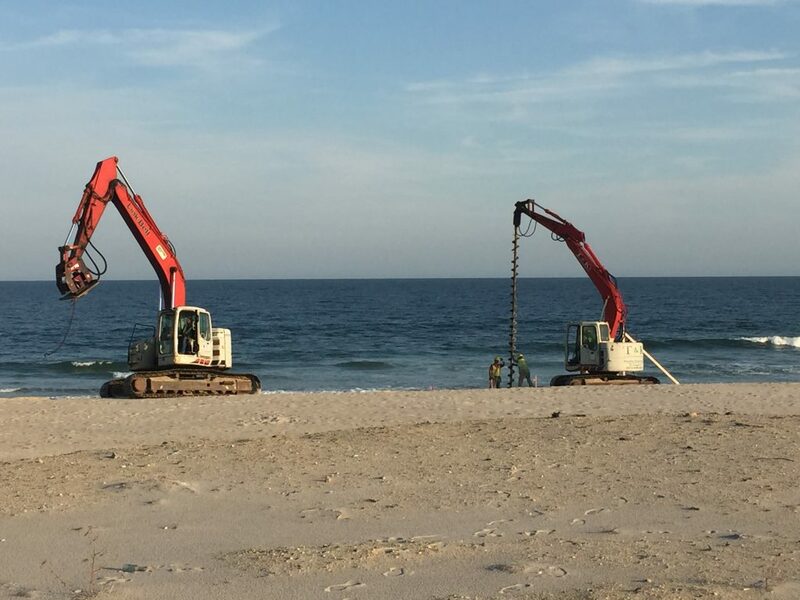 The construction crews were using an excavator and pile driver to drive pilings into the sand and begin construction what will become the surface of attractions on the ocean side of the boardwalk, in the area that was once located between the Beach Bar pier to the north, and Funtown Pier to the south. The property is known as the Belle-Freeman plot, which consisted of retail, food and games constructed on a deck-style pier over the sand. 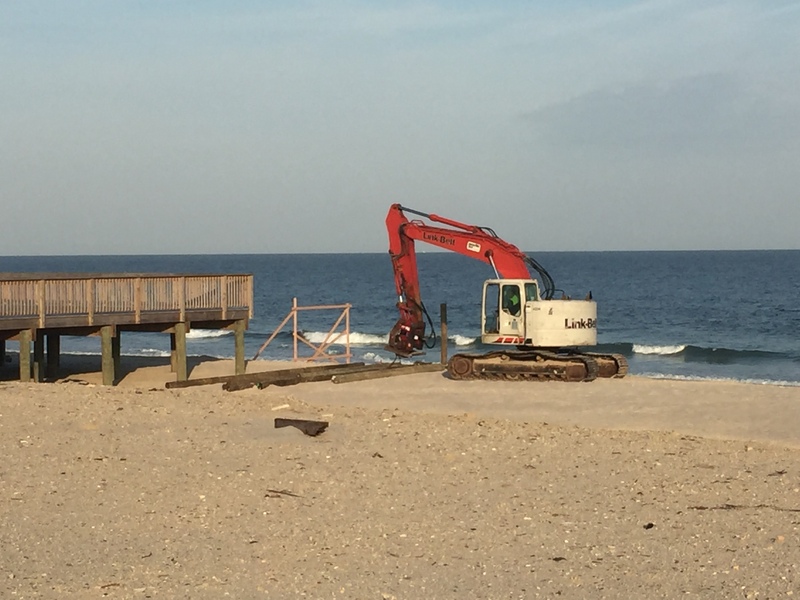 Earlier this year, the owner of the property, local attorney Kim Pascarella, won planning board approval to rebuild the boardwalk and entrance areas. Borough Administrator Christopher Vaz said construction on the pilings and decking are occurring now because they must be completed before the planned federal beach replenishment project begins. It is not yet known what, exactly, will be developed on the pier when it is completed. The reconstruction of the property will mark an important step toward reviving the southern end of the boardwalk, which was destroyed in the Sept. 2013 fire.